With the cold just around the corner, we have some tips for this winter will not be cold at home. More and more citizens in Europe use biomass as a renewable fuel. This article offers seven environmental and economic reasons to install a heating and hot water system using biomass as a fuel. In Sweden, Germany, Norway and Austria biomass is the main renewable energy used for heating and for hot water. 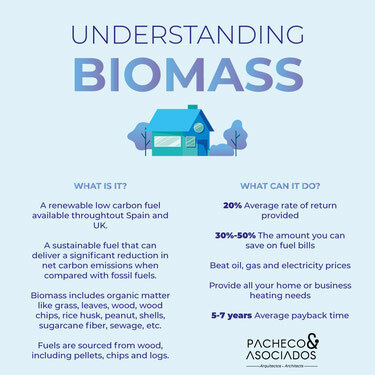 In Spain more and more people are installing a boiler or a collective system with this fuel which comes from surplus and forestry residues. This article offers seven environmental and economic reasons to install a heating and hot water system using biomass as a fuel. Not arguing here I hope. When mountains are cleaned and forest waste are processed to be used as renewable energy the possibilities of forest fires and pests are greatly reduced. In this sense, it clearly fits into the so-called “circular economy” that aims to promote the European Union which intends to transform waste into resources. It is an undeniable fact that biomass is much cheaper than fossil fuels. (See prices below) The use of biomass as fuel also contributes in combating climate change. The emissions of greenhouse gases "are neutral, ie, carbon dioxide (CO2) emitted during combustion has been captured during the growth of trees and therefore introduces no more CO2 in the atmosphere. Proponents of biomass stress that it is very competitive in terms of cost. It is cheaper and has a very stable price, unlike fossil fuels, so more and more people are changing to biomass. According to the Observatory of Biomass Spain has installed 3,500 megawatts (MW) in some 45,000 systems of all types. Even now with oil costs so low, it's still cheaper. As regards to the cost of the facility, depending on the type of equipment used, the amortization periods can range from 2 to 5 years. The central government and autonomous communities provide various economic aids to replace fossil fuels appliances by biomass. The central government grants are handled by the Institute for Diversification and Saving of Energy (IDAE), through its "Biomcasa" program. Another option is to contact the distributors or installers (IDAE provides a list of accredited companies). Although any handyman worth his salts could install a biomass boiler, having said that if you are not confident enough it is always safer and simpler to hire an alternative energy services company. I recommend the latter. If you don’t want to get involved in selecting a boiler or worry about installation, there is another method whereby companies can take care of everything. They sublet systems where the consumer pays only the heat generated and the maintenance and the company maintains the ownership of the system. 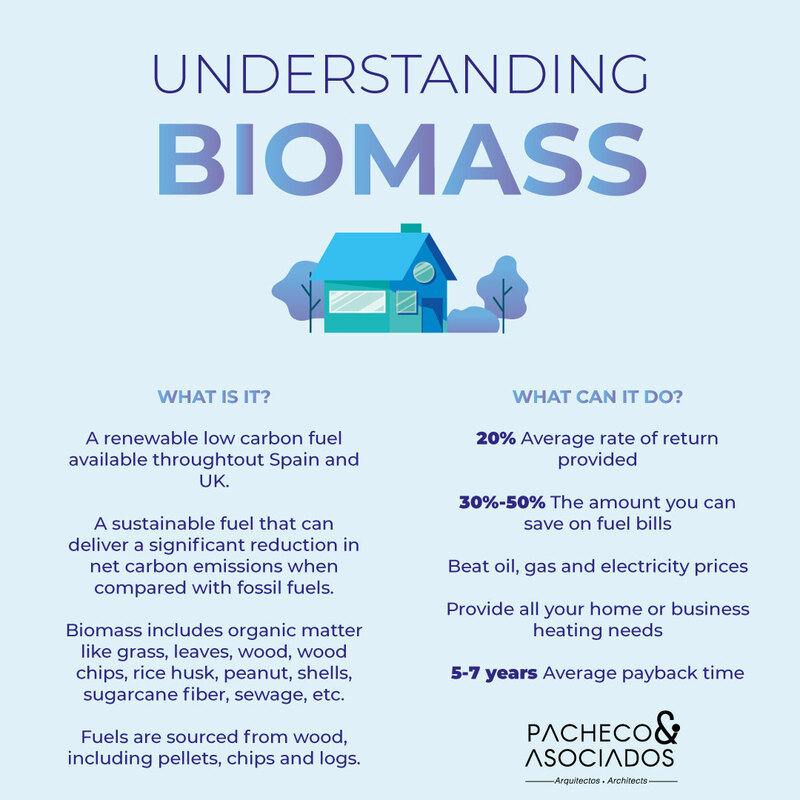 Currently there are two basic types of biomass heating for individual or collective use in Spain. In the first case, single-family homes can use a boiler or stove. In the second a central system for a building can install or even several buildings can be connected to one installation, known as district heating. As the number of consumers increases, the costs are reduced. There are 160 district systems in Spain, especially in the north. The experts indicate that this country is between the sixth and eighth in Europe in the use of biomass for heating. But the potential resources available in Spain would allow taking third place and reaching the major countries such as Sweden, Germany, Norway and Austria, where renewable energy is more widely accepted. We are growing rapidly and, in a few years, we will be better placed, that is for sure. It will depend on several factors, especially greater awareness by the consumers and a real institutional commitment. One of the main challenges of these systems is their greenhouse gas emissions of nitrogen oxide (NOx). Environmental regulations are increasingly stringent and, in the case of biomass, specialist refers to the regulations that will come into force between 2018 and 2020 which force manufacturers to be more restrictive by filtering these emissions. Biomass is produced locally, unlike fossil fuels, mostly imported. The experts consulted emphasize that is one more way to boost the local economy, further reducing the dependence on foreign energy, and also to create jobs, especially in rural areas. For a 200 square meters house in which 6 people live, a boiler of 50,000 Kcal would be required. The specific heat of diesel is twice that of biomass, therefore we need twice the biomass to obtain the same heat, but the price of diesel today is greater than of say almond shells. It is estimated that the boiler in Spain works 1500h per year: Approximately 2 months without stopping. The biomass boiler cost us about 6500€ against 2500€ of the diesel, the difference is 4000€ but every year we obtain a saving on fuel 1.260 €. Conclusion in three years and a couple of months we can amortize the boiler and not pollute the air as well as creating local jobs.